Articulate invites artists who have shown in the downstairs project space or the upstairs gallery to exhibit recently made or un-shown work in Articulate Turns Seven. All proposals will be accepted subject to size, safety and other considerations, to be discussed and negotiated with the artist. Proposals should give artist name and contacts, drawing/photo, dimensions and a brief written description of the planned work, its location in Articulate. We encourage works varying in size to be installed in different locations in the space. Large works are welcome but will be subject to sufficient space once all proposals are in. Please investigate the best method for both attachment/installation and removal/restoration of the site. Bring your own nails, screws, pins etc. Basic restoration materials (ladder, spacfilla, white wall paint and brushes) will be available and bring anything else you need yourself. A room sheet template will be sent out, asking that you fill it in with relevant information. Adjustments to this can be made up until the weekend prior to the opening. Room sheet information includes: artist name, artwork title, year and materials; website, price + explanatory text (optional). Max. total 150-200 words. As there will be no labels, your work will be identified by the room sheet. See 2016 room sheet as a guide. 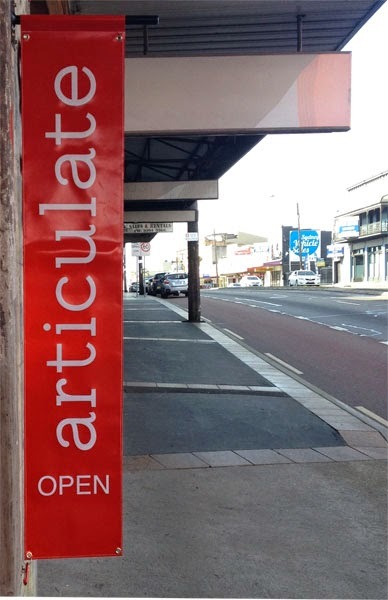 Images of works will be posted on articulate's blog. Please feel free to email your preferred image with title and date, though Articulate retains the right to decide what is posted. $80 includes opening catering and room sheet printing. Artists are asked to assist with setting up for the opening drinks. If available, 3 hours of sitting the space would be appreciated too - a sitting roster will be emailed to participants.